Our beef is not pre-packaged, so you can get the quantity and size you want, not what someone else packaged for you. You get to choose which pieces you buy and if you want a thicker steak, we will cut it special for you. If you need a smaller roast, we can do that too. 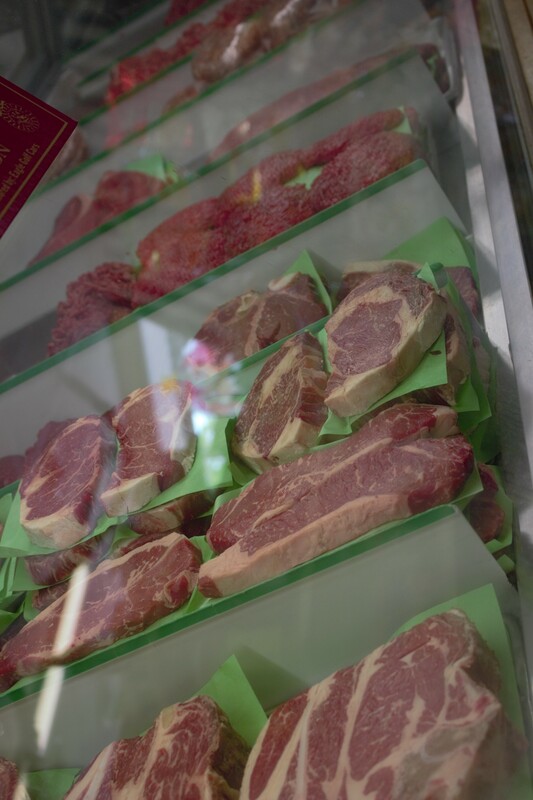 Our meat case is freshly stocked daily with steaks: T-bone, Ribeye, Porterhouse, New York Strip, Round, Sirloin, and Filets. Roasts: rump and chuck roast. Cubed steaks, stew meat, ox tail, liver, heart and tongue. Freshly ground burger, ground chuck and ground round and frozen patties available. NO "pink slime" in our hamburger, ground chuck or ground round. 100% pure quality ground beef. We have bulk, Italian, brats, and hickory smoked sausages. All of our link sausages are in natural casings. Our brats are mildly flavored and are best prepared by parboiling them before grilling. Our brat meat is also available as a patty similar to a hamburger patty.